Summer is coming - and so is the new 14 oz. Catalogue! 14 oz. presents selected product highlights from the current season as well as timeless classics and originals that reflect the balanced variety of products of the 14 oz. brand portfolio. High-quality studio shots are supplemented by photographs of various combinations that have been shot on the premises of 14 oz. and 14 oz. 's 2nd floor Private Shopping area. The precise, clear visual language of the photographies focuses on the essentials - the product is in the foreground. Text features in German and English inform the reader about philosophy, history and manufacturing processes of the introduced brands. You will also find information about the product's country of origin, price, available colours and sizes. 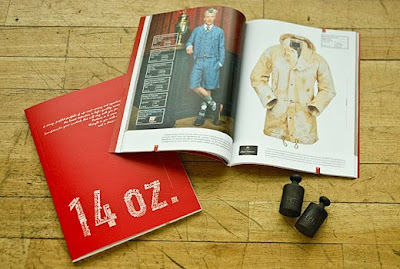 The catalogue is available for free in the 14 oz. store in Berlin but you can also view it on 14oz-Berlin.com. 14 oz. is a store owned by Karl-Heinz Müller who is the founder of Bread & Butter. The store is located in Neue Schönhauser Straße 13, 10178 Berlin. ABSOLUTE BREAD & BUTTER Review Movie Final Cut from BREAD & butter on Vimeo.